Nuts, seeds, and whole grains are good sources of vitamin E, but cooking (heating) or processing these foods, especially flour, reduce their vitamin E content. Other good sources of vitamin E are asparagus, avocados, berries, green leafy vegetables, and tomatoes. Vitamin E is available in natural and synthetic forms. The natural forms of vitamin E are designated d- and the synthetic forms dl-. Even though the dl- form has antioxidant properties, it inhibits the natural d- form from entering cell membranes. Natural vitamin E has greater antioxidant benefit, whereas synthetic vitamin E should be avoided. Tocopherols are the compounds that exhibit vitamin E activity. D-alpha tocopherol is the most active antioxidant form, but d-beta, d-gamma, d-delta tocopherols, and other compounds called tocotrienols also utilize antioxidant properties. Natural vitamin E supplements containing mixed tocopherols offer the greatest benefit. Severe vitamin E deficiency is rare. There are conditions that are associated with low levels of vitamin E – fat malabsorption syndromes (celiac disease and cystic fibrosis), premature infants, and hereditary red blood cell disorders (sickle cell disease). Vitamin E is a chief lipid phase antioxidant in the body. It incorporates itself into the fat portion of the cell membrane along with carrier molecules. Vitamin E helps to stabilize and protect the cell structure from toxic elements like mercury and lead. Drugs, radiation, and the body’s free-radical metabolites are also protected by vitamin E.
It is primarily an antioxidant, protecting against damage to cell membranes, but vitamin E is also important for immune function. It can help protect white blood cells and the thymus gland from being damaged. Vitamin E prevents the oxidation of cholesterol and its carriers, and helps prevent initial damage to the arteries that can ultimately lead to hardening of the arteries (atherosclerosis). In addition to vitamin E’s natural anti-atherosclerotic properties, it has the ability to reduce LDL cholesterol peroxidation and to improve LDL plasma breakdown. Vitamin E may help increase HDL cholesterol levels and fibrinolytic activity. 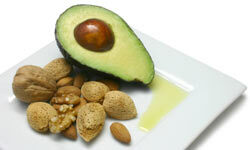 The dosage of vitamin E is partially dependent on the amount of polyunsaturated fats consumed in the diet. Cooking oil made from nuts and seeds are very high in polyunsaturated fatty acids. Polyunsaturated fats are prone to oxidation and rancidity that can damage the cell membrane, but vitamin E helps to prevent against this damage. As the intake of polyunsaturated fats increase, so should the need for vitamin E.
Vitamin E interacts vastly with other antioxidant nutrients such as vitamin C and selenium. It also improves the usage of vitamin A and may be necessary to convert B12 into its most active form, methylcobalamin (or adenosylcobalamin).